The creation of Camp Century, from the outset, was an audacious scheme. Under the thick ice of Greenland, a scant 800 miles from the North Pole, the U.S. military built a hidden base of ice tunnels, imagined as an extensive network of railway tracks, stretching over 2,500 miles, that would keep 600 nuclear missiles buried under the ice. Construction began in 1959, under cover of a scientific research project, and soon a small installation, powered by a nuclear reactor, nested in the ice sheet. In the midst of the Cold War, Greenland seemed like a strategic point for the U.S. to stage weapons, ready to attack the USSR. The thick ice sheet, military planners imagined, would provide permanent protection for the base. But after the first tunnels were built, the military discovered that the ice sheet was not as stable as it needed to be: It moved and shifted, destabilizing the tunnels. Within a decade, Camp Century was abandoned. When siting the secret ice base, the military chose a spot where dry snow kept the surface of Greenland’s ice sheet from melting, and when the base was abandoned, its creators expected the remains to stay encased in ice forever. But decades later, conditions have changed, and as a team of researchers reported in a 2016 paper, published in Geophysical Research Letters, the now-melting ice sheet threatens to mobilize the dangerous pollutants left behind. This hazard-in-waiting is a new kind of environmental threat: In the past, there was little reason to worry about water-borne pollution on an ice sheet 100,000 years old. As Jeff D. Colgan, a professor of political science at Brown University, writes in an article released last week in the journal Global Environmental Politics, Camp Century represents both a second-order environmental threat from climate change and a new path to political conflict. By the time the base was abandoned in 1967, it had its own library and theater, an infirmary, kitchen and mess hall, a chapel, and two power plants (one nuclear, one run on diesel). When the base closed, key parts of the nuclear power plant were removed, but most of the base’s infrastructure was left behind — the buildings, the railways, the sewage, the diesel fuel, and the low-level radioactive waste. In the 2016 paper, which Colgan worked on as well, the researchers suggested that the radiological waste was less worrisome than the more extensive chemical waste, from diesel fuel and polychlorinated biphenyls (PCBs) used to insulate fluids and paints. Overall, the researchers estimated that 20,000 liters of chemical waste remain at the Camp Century site, along with 24 million liters of “biological waste associated with untreated sewage.” That’s just at Camp Century; the military closed down bases at three other sites in Greenland, too, and it’s unclear how much waste is left there. Over the next few decades, the researchers found, meltwater from the ice sheets could mobilize these pollutants, exposing both the wildlife and humans living in Greenland. Creating these ice-bound military bases required a delicate political negotiation to begin with. The U.S. established its bases in Greenland under agreement with Denmark, which governed the island at the time. (Greenland now has self-rule but is still part of the Kingdom of Denmark.) There were some principles outlined about the two governments’ responsibilities for the bases, but, as Colgan writes in the new paper, the status of American nuclear weapons on Greenland fell into a diplomatic gray area. The Danish government had taken a stand against nuclear weapons and would never condone a nuclear base on Greenland. But in 1957, an American ambassador, Val Peterson, made an official overture to the Danish prime minister, H.C. Hansen. If — just say — the U.S. had nuclear weapons in Greenland, would the Danish government want to know? Five days later, the prime minister had a response: “I do not think that your remarks give rise to any comments from my side,” he wrote, in an “informal, personal, top secret” paper. The U.S. went ahead with the plan. There was similar ambiguity around the responsibility for the physical assets of the base. While they remained the property of the United States, the agreement said they could be “disposed of” in Greenland, after input from the Danish government. But it’s not at all clear who’s responsible for dealing with a long-term environmental hazard posed by the waste abandoned there. This problem — who will pay to clean up environmental waste — is a common one; in the U.S., the Superfund program assigns responsibility for a polluted site, often across multiple parties associated with it over the years. But in this sort of international agreement between two governments, there’s no parallel process for divvying up blame or costs. Already, a Greenland politician, who was serving as foreign minister, has lost his job over this issue. After the 2016 paper came out, he started pushing for the U.S. and Denmark to take responsibility for these military hazards; his boss thought he took too aggressive a stance. But the problem isn’t going to go away, and Colgan emphasizes that these second-order environmental consequences of climate change — which he calls “knock-on effects” — are only going to become more common, creating knotty political disputes. Think, for instance, of the chemical and oil refineries that, damaged by Hurricane Harvey, started dumping waste. Many of these environmental hazards, though, can be linked to multiple causes; in Greenland, it’s easier to pinpoint the precipitating issue. “What’s helpful about Camp Century is that, because it’s so isolated, we can be really clear that what’s causing the problem is climate change,” says Colgan. 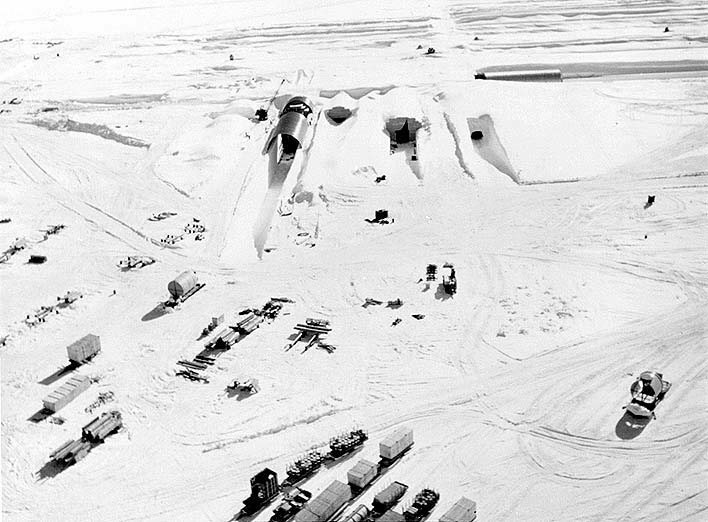 In the 1960s, there was little reason for the U.S. military to imagine that their secret ice-base would cause environmental problems decades in the future. After all, it was encased in ice and should only have been buried deeper into the frozen surface over time. This entry was posted in Doomsday scenarios, Environment, Global warming, Guest Post on February 27, 2018 by Yves Smith. Somebody should tell those guys that if they find a flying saucer and a frozen body that they should immediately call in a tactical nuke. No seriously, they really should. Back to the article. Even as early as 1946 the US had tried to buy Greenland from the Danes but was unsuccessful. Camp Century was actually a test site for what would have been a whole series of secret nuclear bases in Greenland in something called Project Iceworm. Eventually there would have been about 4,000 kilometers of tunnels and about 600 hundred nuclear missiles to attack the Soviet Union with. Of course the fluidity of what looked like solid ice put paid to the project, especially after they had to raise the ceiling of the base’s reactor room by 5 feet after the ice had dropped it. Authorization for the nuclear aspect with the Danes was under a nudge-nudge-wink-wink arrangement. The US had been abusing the relationship though and when a B-52 carrying 4 hydrogen bombs crashed in 1968 it became obvious that the US was ignoring Denmark’s nuclear free zone policy and was sending nuclear bombers here regularly. The US wanted to let the wreckage and radioactive ice just sit but the Danes demanded that the US retrieve it or else no new US base. The US agreed. This is not the only site that the US has built and abandoned for the locals to deal with. A page at https://motherboard.vice.com/en_us/article/vv7b5a/these-insane-photos-show-how-an-abandoned-air-force-base-is-polluting-greenland shows another site that has asbestos and fuel in a pristine environment. Of course the Pentagon could clip out a billion or two from the extra $165 billion that was gifted to them on top of their budget for stuff like this but I would reckon that there is no chance that this would happen. I think that in the end the US will have to budge about this for an interesting reason. In the same way that the base is being uncovered by climate change, so are the polar seas. Russia has not been slow in establishing bases along its norther border to solidify any claims here so it is certain the the US and others will want to do the same. Countries may be reluctant though to host a US base if they know that after the US is finished with it, that they will abandon all the toxic waste for the locals to deal with. If the Pentagon at the moment is asking Congress for extra time to work out what to do with the extra $165 billion that they were given, then perhaps they should use some of it to clean up their toxic waste dump sites. Thankfully we’ve got top-flight political leaders at the EPA and in the administration, together with a set of politically active donors receptive to science, who are all over this broader issue. …Who’s toxic? Greenland has all sorts of surprises under its ice. Back in 1942 six P-38 Lightning fighters and two B-17 Flying Fortress bombers had to land on the ice. Their crews were rescued but the planes were eventually buried in ice. Then back in 1992 a team (http://p38assn.org/glaciergirl/index.htm) went to dig out a P-38 from its grave 260 feet down which they did successfully, rebuilt and had flying again. There are plans to go get the others. This has been speculated about in Danish press for years.